Working at home and being your own boss may be a lot of fun, but it also requires a lot of self-discipline, across-the-board knowledge, and the ability to juggle many things at once. Things like launching a marketing campaign, building a website, and maintaining good accounting practices will all fall on you. The Work-At-Home Super Bundle can help you learn the skills you'll need to navigate the world of self-employment. With 23 eBooks, one audiobook, nine online courses, and four printable packs at your disposal, you'll identify the habits and skills you'll need to adopt in order to have a successful self-employed venture. You'll learn how to create a healthy work-life balance, and discover tips for maintaining the financial and legal sides of your self-employment. 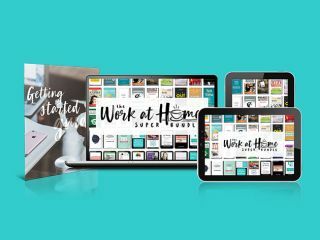 The Work-At-Home Super Bundle will get you up to speed for only $39.99, a saving of 97 per cent.